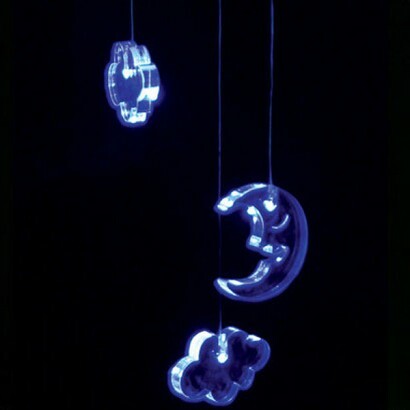 Glowing LED lights gently change colour inside the solid acrylic shapes on these decorative mobiles. A moon and two clouds shine with colourful LED's to cast soothing colour change light into your child's room at night creating a magical restful atmosphere that will help comfort your child into sleep. Reviewed 11 September 2017 by C.D. Service was first class & my little Granddaughter is over the moon with it . Love the moon and clouds led mobile! Bought it for my visually impaired baby granddaughter and she loves it too. She follows the lights when we move it around which is exactly what we hoped she would do. I bought the moon and stars led mobile for my granddaughter and it is just enchanting, the colours are clear and change slowly which is very peaceful. She loves it! I want one!! My six month old baby girl loves this product. It's a simple design yet captivating and effective. Highly recommend. Love this product, we have several of them in the house for our 6 month old who ADORES them.